Actually the relative warmth has only hit the past 2 days. Which was unfortunate for Tim & I and our planned hiking trip this past weekend. This was supposed to be our first real rustic hiking/camping trip ever. We had grand plans to ease in to what I can only assume will eventually be hard-core-lost-in-the-woods-eaten-by-bears style hiking. The cold northern spring had other plans. At the last minute we decided the mid 30 degree weather predictions and possible snow in the forecast were too much for us. We’re not that hardy yet. I’d like to tell you that instead we stayed home and drank lattes and ate cake but in reality Tim installed cabinets, we did some landscaping and planting around our house, we worked on sanding our deck, etc. A million spring projects on our list of things to do. We did find time to drink a lot of coffee, hard rootbeer, hard cider, etc. And when we weren’t (apparently) drunk we also got in about 8 miles of hiking with the beagle and had a very cold bonfire in our yard. Pretend camping. I made this cake a few weeks ago for a birthday. 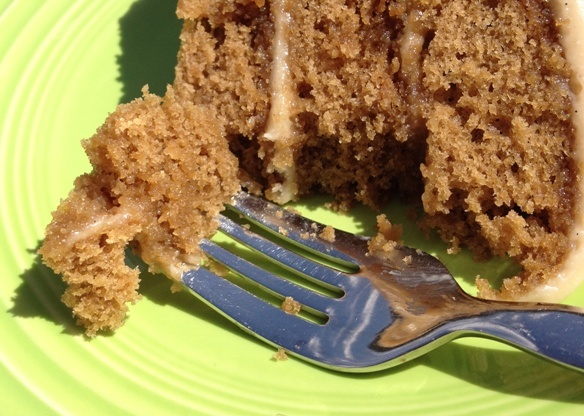 The cake has a subtle coffee flavor that deepens as the cake ages. I found it to be the most delicious a few days later so feel free to make this a day or 2 before you need it. 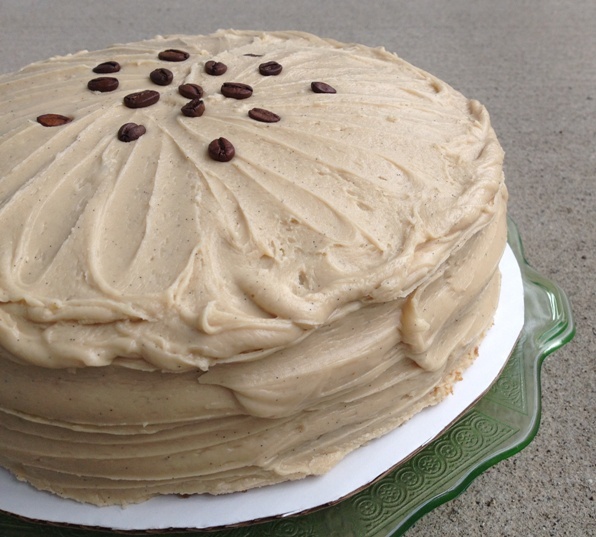 The icing is delicious immediately but keeps well for a few days. I did not refrigerate it, just kept it covered in a cake carrier. 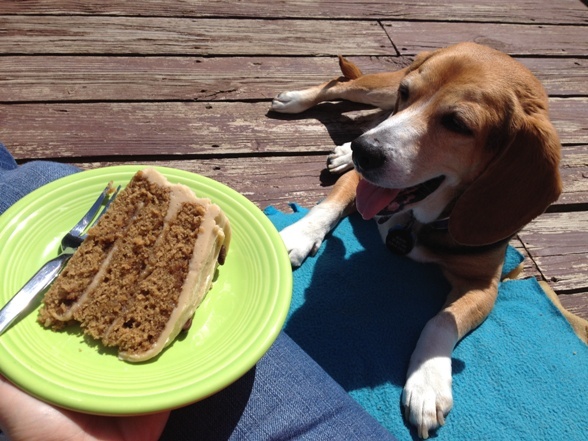 This is what happens when I try to enjoy a slice of cake on the deck. My real mistake was to sit on the floor. A very hopeful beagle kept a watchful eye out for crumbs. I like my cakes to be 3 layers but you could easily bake just 2 layers with this recipe. You’ll just need to increase your bake time a little bit. I just feel like 3 layers is always more impressive and yet not any more work than 2 layers. My real love is those towering layer cakes you see in bakery cases. Six, eight, even ten thin layers with a yummy filling. So pretty and drool worthy. . . but they seem like so much work to produce! You know I’ll tackle one eventually though. 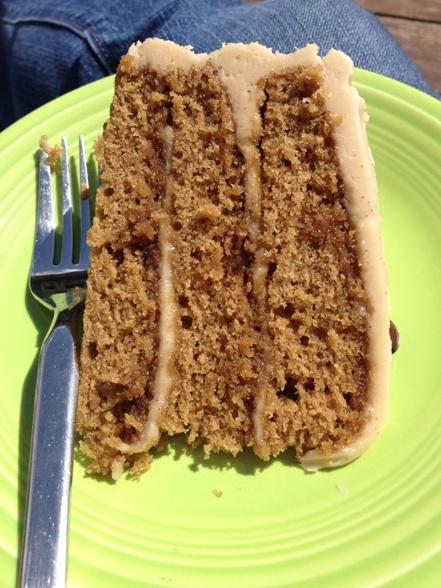 Oh, just a word on the espresso powder in the cake. Instant espresso powder is what you want, not ground espresso. 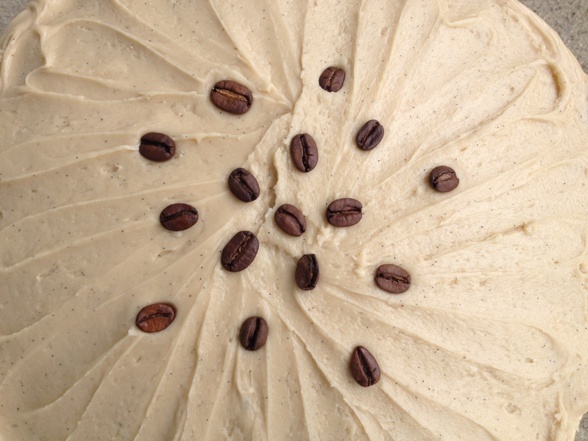 Your cake will be a gritty mess if you use espresso grounds. Instant espresso powder can generally be found in the coffee aisle at the grocery store. It’s similar to instant coffee but much more flavorful. You can swap in instant coffee if you can’t find the instant espresso but you’ll probably want to increase the amount to 3 Tbsps. Preheat the oven to 350 degrees. Grease and line 3 9″ cake pans. Set aside. In the bowl of a stand mixer beat the butter and sugar until light in color and fluffy. Add in the 3 eggs and beat until combined. On a low speed add the milk, espresso powder, vanilla. Once that is incorporated add the flour, baking powder and salt. Once the batter comes together, spread the batter evenly in to the 3 prepared cake pans. Bake for 20 minutes or until a toothpick inserted into the center comes out clean. Allow to cool completely and remove from the pans. While the cake cools make the icing. In a saucepan over medium low heat, melt the butter and add the brown sugar & half and half. Cook while stirring until the sugar dissolves. Pour the butter mixture into a large bowl and add the salt and vanilla. With a hand mixer begin beating the butter mixture while slowly adding a little bit of powdered sugar at a time. Beat until fluffy and creamy.